Fly away to paradise – Cancun International Airport is your destination! After you land at the Cancun airport, you’ll go through customs & immigration. Pick up your rental car or catch an ADO bus and it is about a 1 hour and 15 minute ride to Chemuyil. When leaving Cancun’s airport take Federal Highway 307 south towards Playa del Carmen. Along the way you will find big green and white Pemex gas stations at Puerto Morelos, Playa del Carmen, Puerto Aventuras and Xpu Ha. Continue on past Akumal for 5 miles. Chan Chemuyil is approximately 1 km after the Chemuyil overpass. There’s so much to do and see in the Riviera Maya that you will love having the freedom you get from renting a car, especially with small children. There are car rentals all around the airport and along the 307 highway. They’ll meet and pick you up from the airport and take you to their office. Before we head to the casa, we like to stop in Playa del Carmen at Soriana for groceries and other needed items. You will go through the busiest part of this city on the main highway and find our favorite store at the Centro Maya Mall just before you leave Playa del Carmen. It is located on the east side of the highway. There is also a City Club here that is like Costco or Sam’s Club – with great prices, a nice deli, bakery and of course bulk items. You can purchase a day pass to shop here for $20 pesos. Here at the mall you will also find a couple of banks, a number of ATM machines and a money exchange. You’ll find a good exchange rate here. You can use your debit card at the grocery store here as well as at most grocery and retail stores in Mexico, especially in Playa del Carmen. Some restaurants take credit cards, but not the “mom and pop” type of cocinas. ATM’s are widely available – there is even one in our pueblo of Chemuyil. Gas stations are cash only. Airport Pick Up or Drop Off Available – please let us know if you’d like us to arrange an airport “shuttle” to pick you up and take you shopping at Soriana for an hour for groceries or other items prior to arriving at Casita Paraiso. Our property managers will take care of all of this for a comparable fee. If you prefer to rent a car for a day or two or three days, there is a Hertz Car Rental and Executive Car Rental agency in Tulum. Running Times: 5:00 am – 10:00 pm every 5 – 15 minutes northbound or southbound. How does it work to ride the colectivo? It’s a great way to experience how the locals travel and so easy! You can catch a colectivo anywhere on Hwy 307 from Cancun to Tulum. The easiest place is close to the ADO bus station in in Playa del Carmen. Walk west on Juarez. You will see colectivo vans parked along the curb at Calle 2 Norte between Av. 15 and 20. It’s just a five minute walk from 5th Ave.
Find a van that says “Tulum” or ask which van goes there. When the van is filled to capacity the driver will leave. Sometimes there will be seats open and he will pick up new passengers along the highway. It seems to be a little longer wait for the colective when you are heading south to Tulum from Chan Chemuyil. 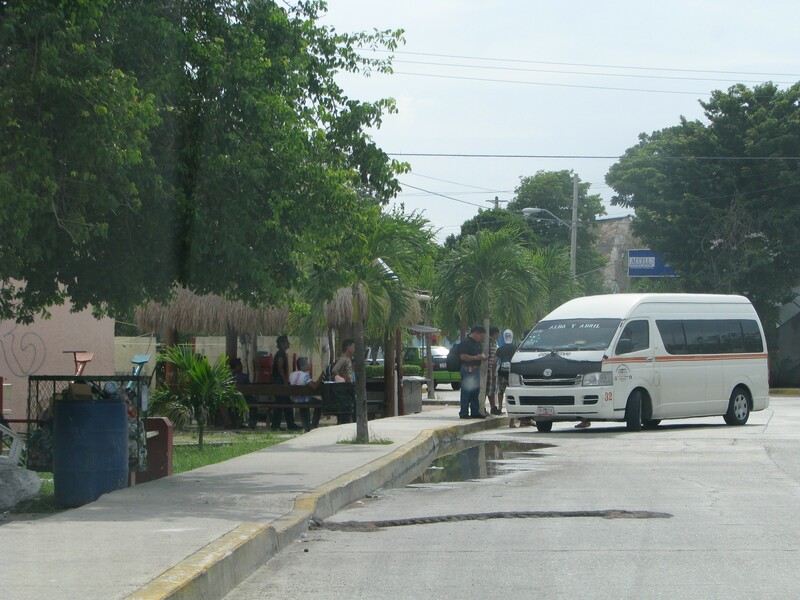 If you are taking a colectivo from the casa and are going north to Akumal or up to Playa, the colectivos run fairly often. Please be patient, colectivos are like the city bus and stop often along the route. You can tell the driver where you are going but don’t expect him to remember. Keep a sharp eye out for your stop and when you get to it just shout out something like AQUI! for here or STOP! will usually work, too. Give 20 pesos (or the appropriate amount) to the driver before you get out of the van. On your return to the casa, to have them stop at the Chan Chemuyil Subdivision, some of the drivers know it as “Fraccionmento Chemuyil”. In 2012, there has been a sign added to the highway marking the neighborhood. Stand on the edge of the highway and try to find a spot with shade. Wait patiently – sometimes they arrive quickly and sometimes it’s a bit of a wait. There’s no set schedule. When a colectivo approaches he will flash his headlights if he has space in his van. If you want a ride, hold or wave your arm up and he will stop. If the driver sees that you are a tourist he will probably stop anyway and pick you up. To catch a colective or taxi going NORTH – stand on the sea side of the highway. Taxis – As briefly mentioned above, taxis are usually not expensive like they are at home. Example of a fare from Chemuyil to Akumal would be about $50 pesos or roughly $5 US. A fare from Tulum to Chemuyil would be about $100 – $120 pesos. Always negotiate your fare before you accept the ride. The fares tend to be more during the holidays at Christmas and Easter. 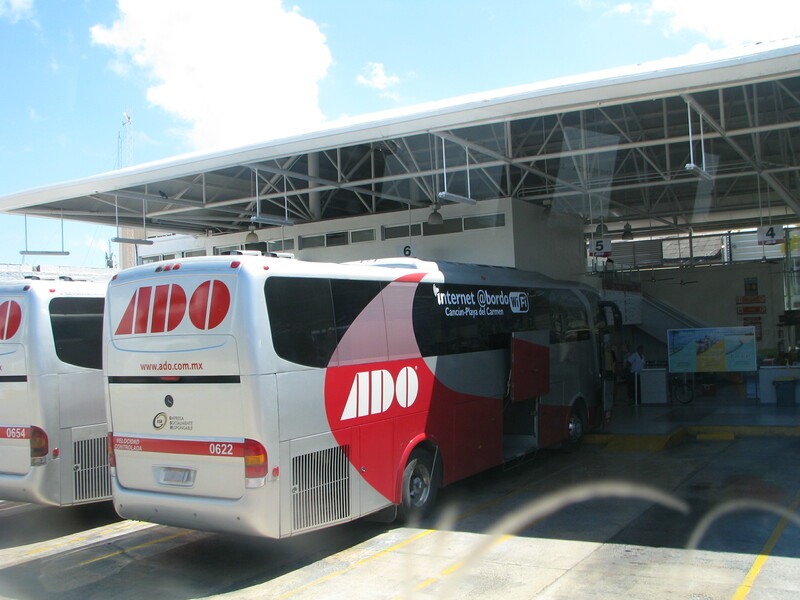 ADO Bus Information – When you leave the terminal, you’ll find a ticket booth to the right. 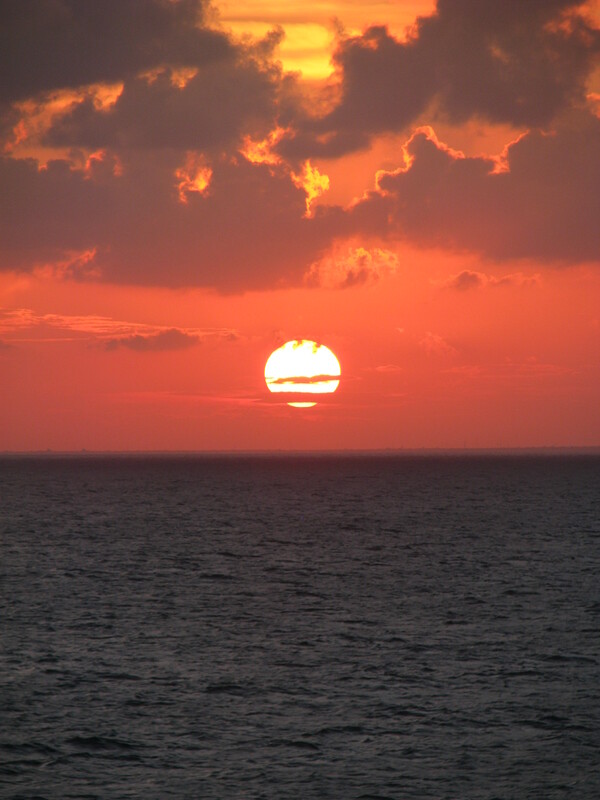 Take a bus to Playa del Carmen or Tulum. The bus to Tulum does not run as often, so ask at the ticket booth to see if the next bus goes there. You can either take a cab from Playa (approximately $25 – $30 US) Bus fare to Playa del Carmen ($110 pesos) or Tulum ($154 pesos) and take a taxi or colectivo the rest of the way. It’s easy! See ADO’s website for more information on riding the first class bus – complete with movies in Spanish! For good information on travel safety in Mexico check the travel advisory at travel.state.gov, and more on safe travel in the Riviera Maya and Yucatan Peninsula at Yucatan Today.